Today's post is by Monte Jacboson, Seattle Opera's PR Coordinator and member of the Seattle Opera chorus from 1964-1996. "My first reaction to the news that Seattle Opera was doing Tristan und Isolde in the 1980/81 season was disappointment. 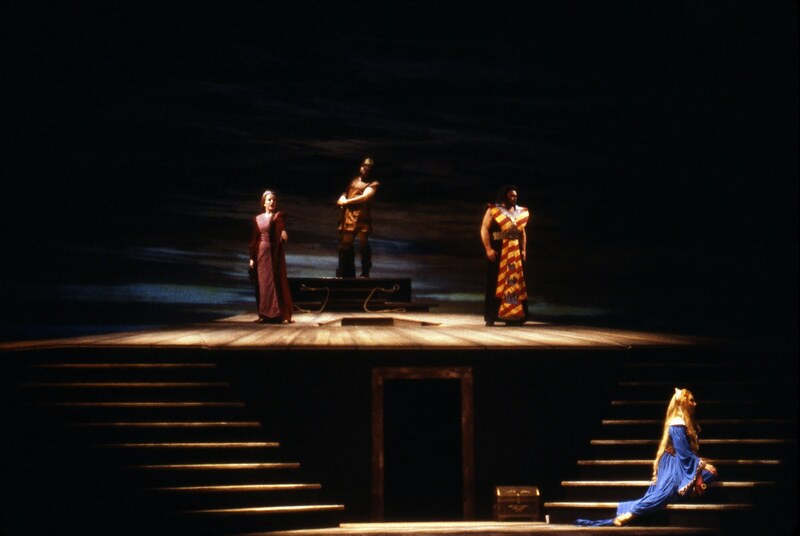 Being a soprano in the Regular Chorus meant that there would be one less production that season (Tales of Hoffmann, Aida, Manon Lescaut, Tristan und Isolde, and Don Pasquale) for me to perform in, as there aren't any women in the Tristan sailor’s chorus." 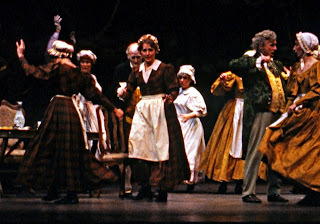 Monte Jacobson as a maid in Seattle Opera's 1981 production of Don Pasquale, starring, to her left, Sir Geraint Evans (Chris Bennion photo). "But my disappointment was totally forgotten when the first chords of the opera began in March 1981. I became totally engrossed with the thrilling performance of Johanna Meier as Isolde and Edward Sooter as Tristan--my first live Tristan und Isolde. I was a regular Met Broadcast listener and had heard the Saturday morning broadcasts of the opera over the years, but never a live performance. Both Meier and Sooter were both attractive, brilliant actors and their voices soared above the orchestra in the Opera House. After the final chords of Isolde’s “Liebestod”, when the opera came to its radiant end, my first thought, after I caught my breath, was: 'When can I experience a live performance of this beautiful opera again?!?'" "When I finally returned to reality, I realized that I could do so that summer at the Wagner Festival in July and August of 1981. The Isolde was to be Ute Vinzing and the Tristan was, again, Edward Sooter. I had sung onstage with Ms. Vinzing, who played Brünnhilde for several summers, as one of the women’s chorus in Götterdämmerung and I knew that I would be thrilled again with her Isolde also." 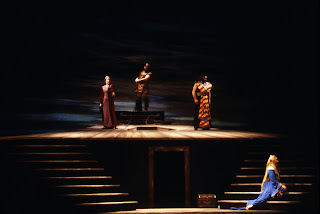 Monte: you so kindly emailed me recently about using a seattle opera photo on my blog. It's so nice to "see" you here and know who you are. I'm excited for my first Tristan und Isolde. Monte, so nice to see your reminiscences of the 1981 Tristan und Isolde - I saw the summer production (but wasn't working on it). Didn't we do the Ring too in the summer of 1981? Good to hear from you! 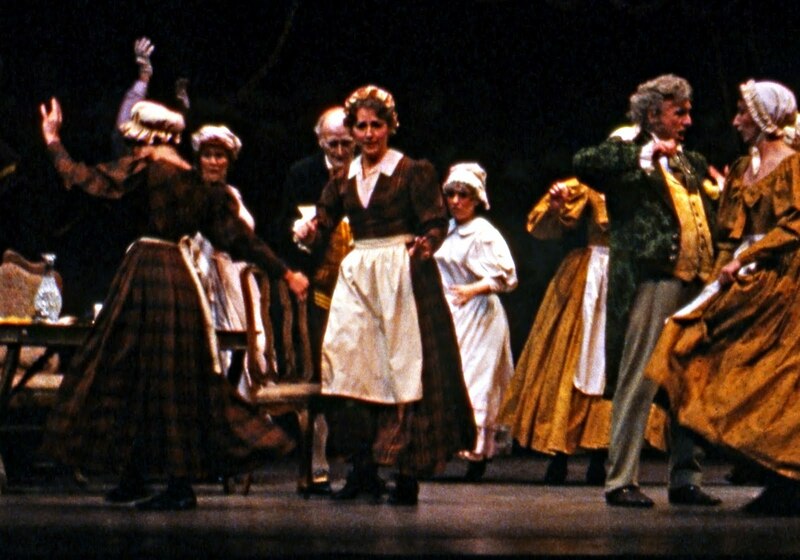 Yes, we did several Ring productions together that included 1981, and also you accompanied me for several opera previews around the city while you were here. I am also glad to see your reminiscences of the 1981 Tristan und Isolde - I was 13 years old and had come with my mother to see my father, Edward Sooter, in the Ring as well as Tristan that summer. 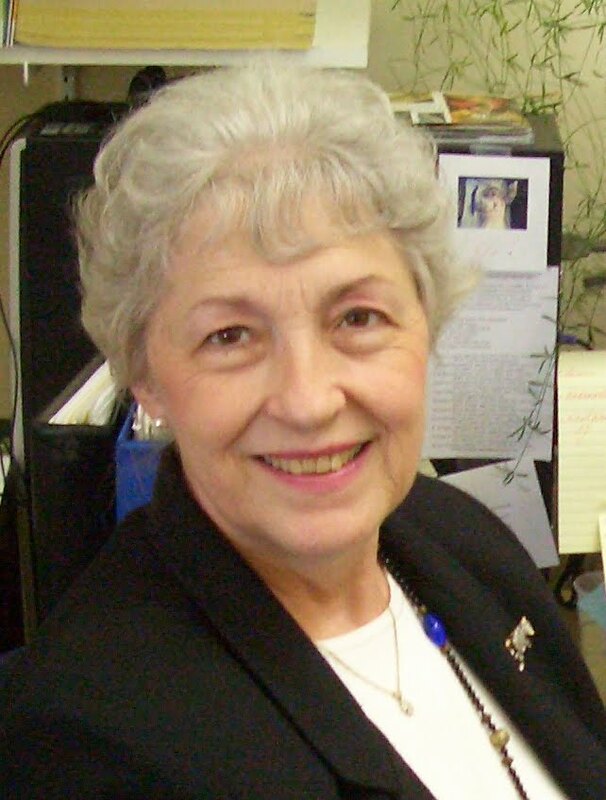 It is especially meaningful to reconnect with this wonderful memory today, since my father passed away June 8, 2010 after a sudden illness. I was so fortunate for a kind friend to gift me her tickets to this years Tristan production which I attended August 4th, and had an emotional reunion with Tristan. I feel blessed to always find my way back to my father in these beautiful operas. Thank you, Seattle Opera, for your ongoing commitment to keeping Wagner close by.